My friend, Nic and I had a meeting to go to, and it was far away and it was during the evening, so we had time to see a movie! And since my wife had refused to go see this with me, we ended up watching The Visit. And the real twist of the film was that it was good! 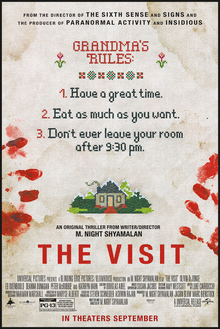 The Visit is the best thing M. Night Shyamalan has done since Signs. It’s not better than Signs. That movie is incredibly rewatchable for being as scary as it is. But The Visit doesn’t need to be rewatchable, it just needs to creep you out, take you on a wild ride of a third act and leave you feeling tense after the credits role. Two kids visiting their grandparents doesn’t seem like it should be scary, but the ravages of age on the human brain can be frightening to young children. And the kids in this film are freaked out by behavior they haven’t seen or expected. But for the viewer, because we know who the director is, we’re sure it’s not just sun-downing or dementia. We know there is something else, right? The Visit has a few red herrings to throw at us, but the end reveal left me satisfied and I found it creepier than going in the other direction. It helped that my friend and I were the only two people in the theater so I could really let myself react to the scares. I’m not one for talking to the screen, but there were plenty of times when I shook my head and yelled “No, I don’t want you to do that”, hoping to save myself from more tension. If this movie had come out post-Signs or even after The Village, I think Shyamalan would be in a better place today then he is now. Luckily, The Visit is strong enough that I’m actually willing to call it a come back and see what else this once lost director has to offer. It will be a long time until he regains my full trust, but this is a good first step. For different adventures this Halloween, all my friends are blogging our holiday celebrations! First we have Smallville Chronicle with Nic Gunning, a long-time friend, co-worker and all-around fun time! Then we have Sallylife’s Blog by Sally Murphy, another long-time friend, artist and all-around fun time! And then there’s Musings From a Music Box by Kendra Mikols, my lovely wife, singer and all-around fun time! Posted on October 30, 2015, in halloween, movies and tagged halloween, m. night shyamalan, movie review, the visit. Bookmark the permalink. Leave a comment.